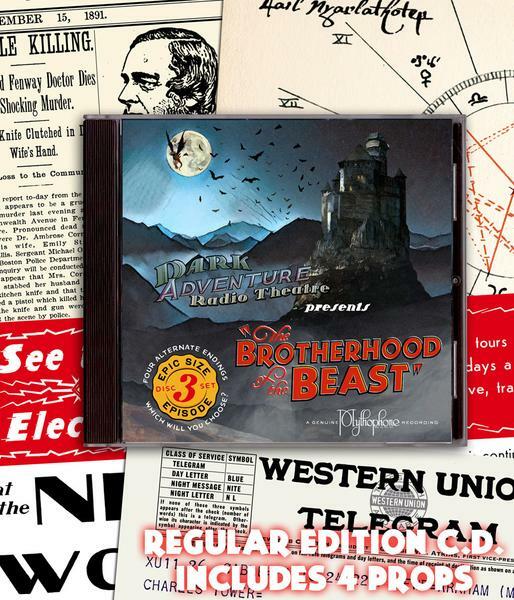 The Brotherhood of the Beast (BHOTB) is an EPIC audio horror drama spanning approximately 3 hours, reminiscent of 1930s era radio talkies. You’re probably thinking, “Wait … this is a gaming review site! This isn’t a game! Why do I even care?” Well, here’s a little history lesson for you. The H.P. Lovecraft Historical Society (HPLHS), the creators of this talkie, are proprietors of props for various purposes, like film productions, radio plays, miscellaneous products, pseudopods and polyps. 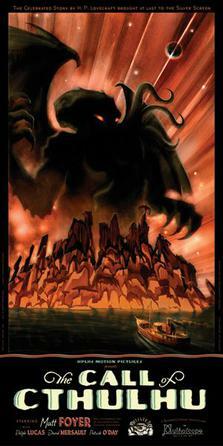 Most of it is based on Lovecraft‘s works and,, more recently, the writings of Edgar Alan Poe. Their 2005 silver screen silent film Call of Cthulhu is considered the most faithful adaptation of any Lovecraft story in existence (it’s also a great film to boot, with IMdB giving it a modest 7.3/10 but Rotten Tomatoes scoring the film a well earned 100%). The founders of the HPLHS, classically trained actors Sean Branney and Andrew Leman, have a lengthy history in the field of Pen and Paper Role Playing games and, more infamously, their Live Action Role Playing games where actor Nick Offerman himself participated prior to being pre-occupied by his leap to stardom. Offerman has even allowed the HPLHS to create props in his personal workshop. Branney and Leman have dedicated most of their life to creating a true Lovecraftian experience in many different and creative formats, most of which can be purchased from their site. 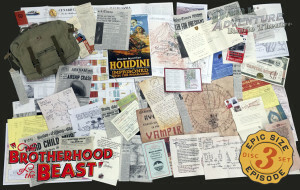 One of their popular products is the Dark Adventure Radio Theatre series, currently spanning at an impressive 11 albums, including The Brotherhood of the Beast, with more to come. Professor Nathaniel Ward and adventurer Charlie Tower are roped into investigating a string of child murders in the Boston region. This simple call for assistance by the police quickly escalates into a global adventure filled with conspiracy and horror, featuring exotic locations such as Transylvania, Peru, San Francisco and Egypt. The team of two quickly grows in number to create an interesting dynamic including a charismatic female ‘affiliated’ with organised crime, a skittish astrologer and a hardened Maori bodyguard. I found myself growing attached to the characters and fearing for their safety as they dived head first into dangerous territory. Branney and Leman have confirmed this is an adaptation of the Fungi from Yuggoth campaign they played in the ’80s, featuring characters they had originally created themselves for the Call of Cthulhu role playing game. 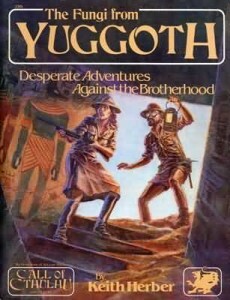 Being a fan and regular player of the Call of Cthulhu role playing game, I could envision the HPLHS playing the game in the back of my mind as I listened to each chapter. I found myself thinking, “Wow! They definitely failed that throw roll! Good thing the Keeper (as the gamesmaster is called in Call of Cthulhu) is merciful.” Or, “Hahaha! Oh, Jenny! You’re great with that Charm skill.” Fans will easily be able to identify classic and almost clichéd Call of Cthulhu moments including often used dialogue used by players unfold before their very ears. A very clear nod by the creators to the production’s role playing roots. Maybe you’re thinking, “What about me? I’ve never played a pen and paper role playing game.” This radio talkie is still accessible to those unfamiliar with role playing and the works of H.P Lovecraft. In fact, it’s probably a good introduction to how the role playing game progresses and gives the listener a feel for the Lovecraftian narrative, if not a little high adventure. 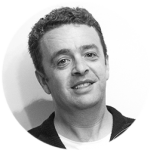 For those new to radio talkies or audio productions, BHOTB may have some listeners feel they are treading water in the deep end of a pool. This adventure is dense with information and narrative, often moving at break neck speed which may be daunting. Fortunately, there are other HPLHS productions which may help first time listener’s to this format of entertainment ease themselves into the water. The voice acting is of great quality and it’s fantastic to hear an authentic New Zealand accent. The production standards are high end with crisp sound effects and a beautiful music score. There were some minor anomalies such as echo effects cut slightly shorter than intended or a slight dip in some of the voice acting performances, but nothing which majorly retracted from the overall production. As I’ve briefly mentioned, the HPLHS are also known for beautiful props. The jewel case CD comes with 4 paper props for you to read, all of them directly featured in the BHOTB itself! Not enough for you? How about your choice of a vintage or retro bag cram packed full of 54 paper props featuring newspaper clippings, pages from archaic tomes, large maps and letters along with your CD? You can pause the audio and look over the very same clues the characters uncover during the course of the story. I can guarantee the printing job and materials used for these props are of the highest quality, never failing to disappoint. All of them are great for use in any of your horror role playing sessions. For those on a tight budget you can always purchase the digital download. 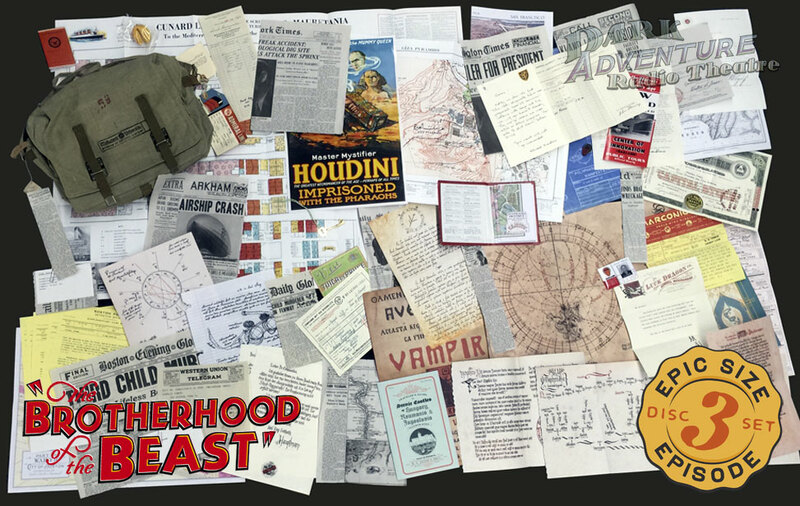 Brotherhood of the Beast is a thrilling and enjoyable way to spend a lazy afternoon, gripping you from start to finish. You can casually listen to the production or go the full hog with an impressive number of props to enhance your experience! This may be too much too soon for a listener new to radio theatre, but there’s only one way to find out. You can order The Brotherhood of the Beast from the H.P. Lovecraft Historical Society website. To find out more about the latest reviews, stories and other cool things in the world of games, like us on Facebook. And remember – if you’re game, we’ll play!